In Computer Graphics Vol. 31 Num. 3 August 1997, pp. 62-63, ACM SIGGRAPH. The design of several current educational environments increasingly reflects the constructivist pedagogy, by which learners actively construct and interrelate knowledge and ideas. The NICE project is an immersive participatory learning environment for young users; its underlying theoretical framework combines constructivist educational theory with ideas that emphasize the importance of collaborative learning and narrative development. As a joint project between the Electronic Visualization Laboratory and the Interactive Computing Environments Laboratory at the University of Illinois at Chicago, NICE is an effort to build Narrative-based, Immersive, Constructionist/Collaborative Environments which encourage exploration and experiential learning. The children's main activity in NICE is to collaboratively construct, cultivate, and tend a healthy virtual garden. At the same time, they create stories from their interactions with the garden and the other children that share the same virtual space. The highly graphical, immersive virtual space has primarily been designed for use in the CAVE(tm), a multi-person, room-sized virtual reality (VR) system developed at the Electronic Visualization Laboratory of the University of Illinois at Chicago. As the CAVE supports multiple simultaneous physical users, a number of children can participate in the learning activities at the same time. All users wear special lightweight glasses, which allow them to see both the virtual and the physical world unobtrusively. Using a light-weight hand-held device for interaction, the children may plant, grow, and pick vegetables and flowers, climb over objects, leap in the air, shrink to observe the root system of their plants, or change the flow of time. Familiar methods of interaction are employed, which eliminate the use of menus and instead use simple visual metaphors. The children can thus water their plants by pulling a raincloud over them, provide sunlight with the use of the sun, or clear the garden weeds by recycling them in the compost heap. Such symbolic representations of the various environmental elements are used to facilitate the learner's understanding of complex ecological interrelationships. When the raincloud has been over a plant for too long, the plant will hold up an umbrella, thus providing direct feedback to the child. In addition to facilitating social interaction amongst the children working on NICE in the CAVE, collaboration is also enabled across virtual communities of children. The network component of NICE allows multiple networked participants to interact simultaneously with the same virtual environment and each other. Each remote user's presence in the virtual space is established using an avatar -a graphical representation of the person's body in the virtual world. 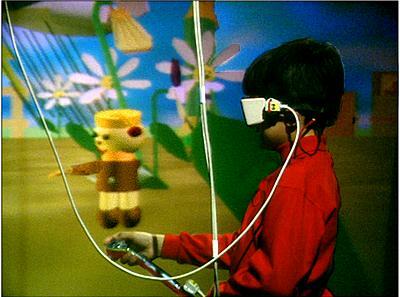 The avatars have a separate head, body, and hand, which correspond to the user's actual tracked head and hand motions. This allows the environment to record and transmit sufficiently detailed gestures between the participants, such as the nodding of their heads, or the waving of their hand to the other participants. To overcome the current cost and limited accessibility of immersive VR systems, we have extended the collaborative aspect of this project to platforms of broader use. Students without access to a VR system like the CAVE, can still participate through any computer connected to the Internet. With the use of a simple JAVA interface, children interacting with a two-dimensional version of NICE on the Internet can simultaneously share and manipulate the same three-dimensional space as the children in the CAVE. They can also converse with all other, virtual and remote, participants by typing in the provided text area -a feature which resembles text-based virtual environments, such as MUDs. In addition to the electronic artifact - the planted garden - the children are also constructing a narrative artifact - the stories formed by the learners and teachers that create it. Every action in the environment and every interaction amongst the virtual participants adds to the story that is being formed continuously, as the virtual world never ceases to evolve. The action is captured through a simple transcript and automatically parsed to look like a picture book, which is then placed on a public WWW site. The children can access and print their garden and their stories anytime. Figure 3: A NICE story and the VRML garden on the web. One of our main goals with NICE is to study the effectiveness of a virtual environment as a conceptual learning and evaluation medium. This is a difficult challenge, as there is little consensus regarding assessment within the education community and effective evaluation methods specific to VR technology are required. Our belief is that learning and assessment should not be separate, but take place simultaneously during the virtual activity. Our evaluation paradigm, currently being formed and tested with children, 6-10 years of age, includes methods for facilitating learner's discourse while in the environment. The remote avatars in NICE can be teachers, which serve multiple purposes as guides and evaluators. Through the case studies of individual children as well as entire classrooms that have participated in NICE, a number of interesting research issues including cooperative learning and performance aspects have been observed. While the NICE environment supports real-time remote audio, the children greatly enjoy exaggerating their gestural communication. They exchange flowers and thank each other non-verbally by waving, moving their heads up and down, or bowing. They also wish to see the presence of their own avatar body mirrored in the environment. NICE includes a "reflecting sea" where the users can see what they look like on the surface of the water surrounding the island where the garden is located. We believe that a VR environment can provide rewarding learning experiences that are otherwise difficult to obtain. Ecological systems are usually complex models with many variables and behaviors that young children have difficulty visualizing. Computers can be effective at reducing the complex models into simpler qualitative relationships (e.g., no water is bad, a moderate amount of water is good, too much water is bad). VR adds the qualities of immersion, direct engagement, immediate visual feedback, and exploration to such models. In the virtual garden, the children have the ability to scale and position parts of an ecosystem, or accelerate time to observe quickly and directly the effects of their changes. While in a real garden they can learn how to plant, in the virtual garden they can learn how to think about plants, take on different roles, change their own size, interact and cooperate with children at distant locations. As virtual reality systems are becoming more accessible to the public, we believe that the development of research-based environments such as NICE, coupled with concrete evidence of their educational value, will become essential for the future educational literacy of both learners and teachers. The authors would like to thank the members of the EVL and ICE laboratories, especially Tom DeFanti and Maxine Brown for their help and support. Special thanks go to Jim Costigan, Eddie Riveron, the original YAW team, and all other teachers and students who are participating in NICE.